Whether you were with it or not, Pynchon's first novel V. had some prodigally exciting sequences to startle the most phlegmatic imagination. Here, however, his narrative verve has shrivelled into sheer bizarrerie. So much of it is not only unidentifiable but also unintelligible-- it's not to be read as much as deciphered. The third chapter opens with "Things then did not delay in turning curious" but it has been prefaced with all kinds of Happenings after Mrs. Oedipa Maas leaves her husband Mucho. He's a disc jockey spooked by his dream of the car lot where he had once worked. She spends a night with a lawyer in a motel, playing Strip Botticelli in front of the tube. And from then on Oedipa's search, in fluid drive up and down the freeways, to the Yoyodyne electronics factory in San Narciso, into a strange society called The Tristero and for the answer to a reappearing symbol-- W.A.S.T.E., back to her psychiatrist Dr. Hilarius, and to Mucho who now knows the answer to the "crying" of the lot (it's N.A.D.A.) 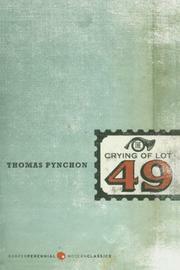 -- oh well, this is all a dizzying exposure to what is presumably a satire of contemporary society and its fluor-essence, Southern California... Pynchon's accessories include names (Driblette; Koteks; Genghis Cohen); props (feeding "eggplant sandwiches to not too bright seagulls"); insets (a long Jacobean play) and in jokes... HELP! Even the Beatles can't and they suggest the singing group called the Paranoids. Somehow it seems as if a genuine talent had reduced itself to automated kookiness. Hip, yes; hooray, no.